The MBTI Step II assessment takes personal development to the next level. 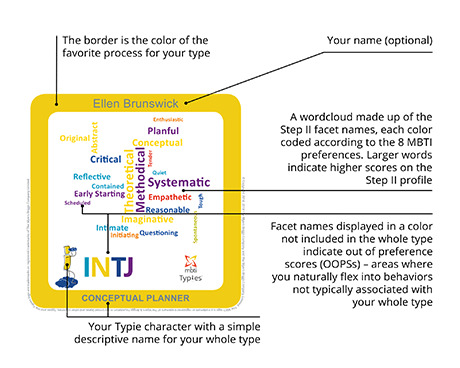 Personal Typies® are a way to share your rich and unique expression of your MBTI Type in an easy-to-read and fun format. If you already have your MBTI Step II results you can create your Personal Typie right away. What is a Personal Typie? Your Personal Typie builds on your Typies pictogram to reveal the additional insights of your MBTI Step II profile. How can I make a Personal Typie? If you know your MBTI best fit type and have an MBTI Step II report, you can create your own Personal Typie in just three simple steps. You can customise your Personal Typie by choosing the font and orientation of the Step II facet wordcloud - making it as individual as you are! You can also create your Personal Typie in several different languages. When you're done, you're free to download, print and share the image in any way you choose to let others know more about you. You could also print your Personal Typie onto any number of everyday objects through custom printing providers. © Copyright 2014 The Myers-Briggs Company and The Myers-Briggs Company Limited. Typies and the Typies logo are trademarks or registered trademarks of The Myers-Briggs Company Limited. Don't have Step II results? Already have your MBTI Step II results? Do your team members also have a Personal Typie? Then create your Team Typie now! If you’d like to be the first to hear about our future MBTI user events, or even get involved with an event yourself, register your interest to let us know.